Churches, places of worship and community halls have many requirements and that's why these versatile portable partitions fit the bill. 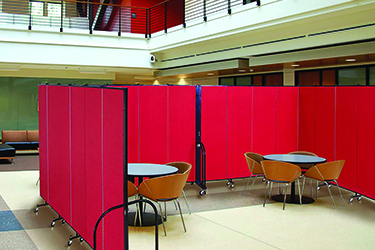 Administrators, teachers, and students alike will enjoy the versatility and privacy these accordion-style classroom dividers partitions provide. Instant privacy in a variety of settings including doctors office, dental facility, pharmacy, hospital, nursing home, or emergency relief centers. Screenflex room dividers are a very viable and feasible option for the the hospitality industry. Partitions are great for creating “L”, “U”, cross, or curve shapes. Perfect for industrial and commercial use, these dividers provide a durabie solution in airports, arenas and other rigorous environments. In two minutes, see how using the best portable walls on the market can add new life to your facility.